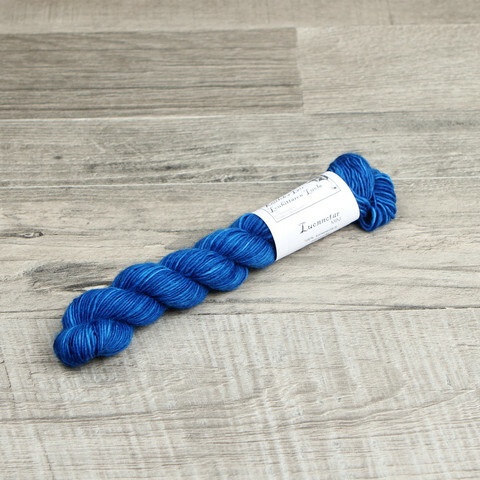 This yarn has been dyed in shades of bright blue. The colorway "Sini (Blue)" is included in the regular colors of the Lair's color charts. All items have been photographed and listed on our site to best reflect the colorway and the yarn. Please bear in mind that colors and shades may appear different on different displays. Differences are also possible between different dyelots. Yarns from several dyelots may be available. When ordering several skeins of one colorway we attempt to ensure they are all of the same dyelot and/or as similar as possible. However, it is not possible to ensure all skeins are of the same dyelot or similar to one another, despite them being of the same colorway. If you wish to receive a larger amount of a colorway for your project, we recommend ordering it as a custom dye job. Then all the skeins have been dyed in the same pot specifically for you.